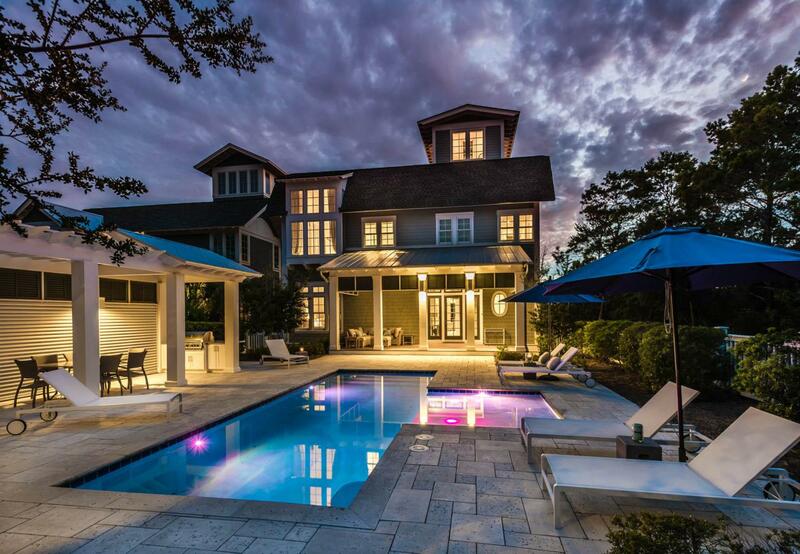 Perfectly positioned on one of the largest homesites in WaterSound Beach and offering breath-taking panoramic Gulf views, this 7-bedroom beach house boasts unmatched outdoor space perfect for hosting guests or large family gatherings. The expansive courtyard offers a spacious pool deck with a large pool, a pergola with an outdoor dining area and a covered summer kitchen. The entry, finished in shiplap, asserts soaring ceilings and beautiful tile flooring that transports you to an additional living room adjoined to two king bedrooms with ensuite baths. Off of the living room extends an expansive screened porch that provides additional coveted outdoor space. Adjacent to the foyer is a guest bedroom with an attached bath and a spacious double bunk room. Offering a fun and functional reversefloor plan, the heart of the home can be found on the second level. The spacious kitchen and oversized island with quartz countertops, tons of storage and breakfast bar seating opens up to the living and dining areas that boast vaulted and coffered ceilings with many windows to fill the space with natural light. Soak up the incredible emerald views from the expansive covered back deck that was made to entertain. Featuring vaulted ceilings and huge windows with transom lights, the master bedroom offers his and hers closets, a separate office and an ensuite bath. The luxurious master bathroom offers a double vanity, soaking tub, and marble shower. The third floor offers a wet bar and an additional king bedroom with soaring ceilings, an ensuite bath, and beautiful views in your favorite hue of blue. The fourth-floor tower's observation deck is the perfect spot to unwind and enjoy the incredible sunset views year-round. The appointed carriage house located above the two-car garage offers separate sleeping quarters with an open concept great room and a full kitchen. The covered back porch located off of the pool deck greets you with ipe decking and a large corner couch that is serviced by the wet bar conveniently located just inside the foyer. The large laundry room and a half bath accessible from the pool deck complete the main floor of this home. No detail has been overlooked in this immaculate WaterSound Beach house that makes a memorable impression from beginning to end.